Table Mountain is at the northern end of a sandstone mountain range that forms the spine of the Cape Peninsula. The main feature of Table Mountain is the level plateau approximately 3 kilometres from side to side, edged by impressive cliffs. The plateau, flanked by Devil’s Peak to the east and by Lions Head to the west, forms a dramatic backdrop to Cape Town. This broad sweep of mountainous heights, together with Signal Hill, forms the natural amphitheatre of the City Bowl and Table Bay harbour. The highest point on Table Mountain is towards the eastern end of the plateau and is marked by Maclear’s Beacon, a stone cairn built in 1865 by Sir Thomas Maclear for trigonometrical survey. It is 1,086 metres above sea level, about 19 metres higher than the Cable station at the western end of the plateau. 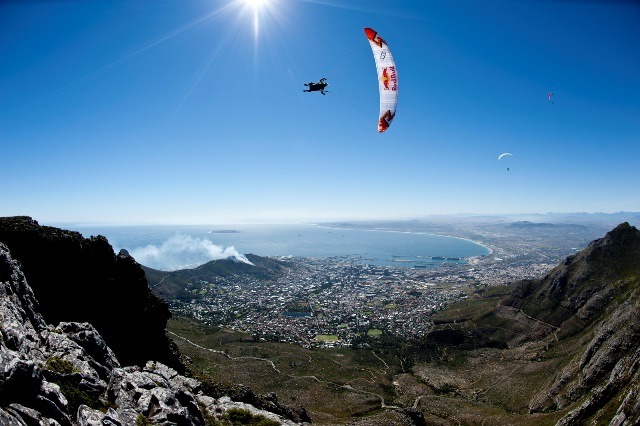 There are three different take off sites on Table Mountain, with all of them requiring a different wind direction. The Gully is the easiest take off and can be flown in a South West to South-South-West. Maclears Beacon is probably just as scary as the Front Face and also leaves no room for error. Maclears Beacon can be flown in a light South-East to East-South- East. We provide transport back up the mountain at no additional charge. very cool article stephan. be nice if there were some maps/marked spots as well.